P. Licinius Egnatius Gallienus succeeded his father Valerian when the latter was taken prisoner by the Persians in 260. His reign was one of the most ignoble and disastrous in the history of Rome. Gallienus was at length slain by his own soldiers in 268. Obverse: GALLIENVS P F AVG, Radiate and cuirassed bust right. Reverse: DEO MARTI, Mars standing left in tetrastyle temple, holding shield and spear. 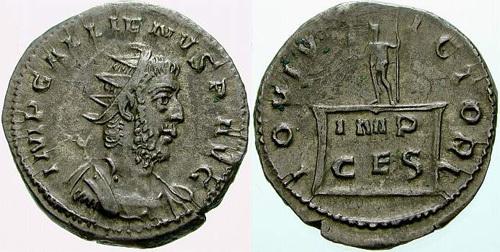 Obverse: GALLIENVS P F AVG, Radiate and cuirassed bust left, holding spear over right shoulder, shield on left arm. Reverse: DEO MARTI, Mars, holding shield in right hand set on ground, spear in left, standing left within tetrastyle temple. Obverse: IMP GALLIENVS PIVS AVG, Radiate cuirassed bust right. Reverse: FIDES MILITVM, Eagle standing left on globe, head right, holding wreath in beak; signum to left and right. Obverse: GALLIENVS P F AVG, Radiate and cuirassed bust left, holding spear over shoulder and shield decorated with aegis. Obverse: GALLIENVS.P.F.AVG, Radiate and cuirassed bust left, holding spear over right shoulder, shield on left arm decorated with a goron. Reverse: GERMANICVS MAX V, Trophy; bound captive to left and right. Obverse: GALLIENVS AVG GERM V, Radiate and cuirassed bust left, holding spear over shoulder and shield decorated with aegis. Obverse: IMP GALLIENVS P AVG, Radiate, cuirassed bust right. 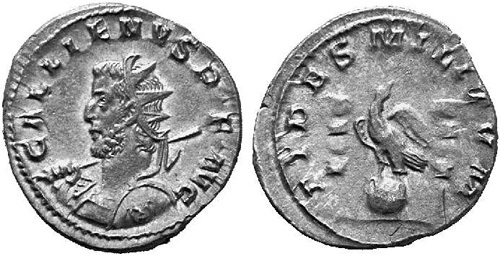 Reverse: IOVI VICTORI, Jupiter standing left holding Victory and spear on top of cippus inscribed IMP C E S (The Emperor and his Army). Obverse: IMP GALLIENVS AVG, Radiate, cuirassed bust right. Obverse: IMP GALLIENVS P F AVG, Radiate, cuirassed bust left, seen from front, holding spear over shoulder and shield decorated with Medusa head. Obverse: IMP GALLIENVS P AVG, Radiate and cuirassed bust right. 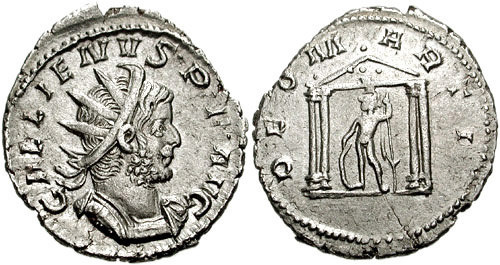 Reverse: RESTIT GALLIAR, Gallienus standing left, holding sceptre and raising Gaul who is kneeling before him. Reverse: ROMAE ATERNAE, Roma seated left on shield, holding, Victory and spear.